Arteriography is a specialized technique of radiology developed to show up the inside of arteries so that thickening and furring can be detected. This tissue damage in arteries is the degenerative disease known as arteriosclerosis. It contributes to coronaries and strokes and to poor circulation in the legs. The arteries are shown up by the injection of a radio-opaque dye which reveals irregularities of the vessel wall. The picture here, obtained after injection of a dye into the aorta, shows the large arteries of the pelvis and upper legs and a local narrowing of the artery (arrowed) that is interfering with the blood flow. Arteriography is an imaging technique for examining blood vessels. 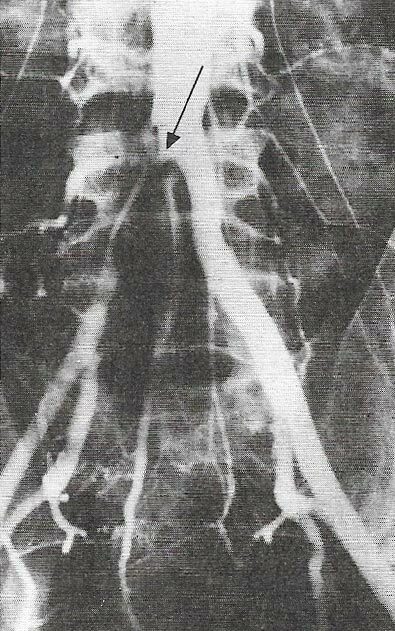 A dye opaque to X-rays, called contrast material or radiopaque, is injected into the patient's bloodstream and the arteries are revealed in an X-ray photograph. The technique is particularly useful in detecting atherosclerosis.